I started my internet business thinking it was going to be super easy; that I’d have a product and have tons of interested people wanting my products and offers. Truth was-I had no one wanting what I had to offer. Not even my friends and family were very supportive of what I was trying to do, my posts on social media didn’t get much, if any, engagement and my ads on the classifieds sites didn’t get any interest. Needless to say I had no leads, no sales, and of course, no money! My dream of living the “laptop lifestyle” was quickly fading as I knew if I didn’t figure this internet marketing out, that I’d have to stay at my job chained to a desk 6 days a week. I knew making money online was possible because other people were doing it. Just the question of “how” was the problem. Since I didn’t know where to start, I began researching how others were selling products and just watching the money roll in. I found there were many aspects of internet marketing and there was so much to learn. Even though I already had a product to sell, the next steps were to define a target market, get them interested enough for them to visit my site and hopefully browse around, then get them to actually buy something, and lastly stay in touch to resell them in the future or possibly have them upgrade to a higher grade product. That all sounded great, but I didn’t know how to keep in contact with a customer to resell or upgrade their purchase in the future. That was until one day I landed on a video that put all these pieces together for me. The video explained how you could get your prospects email, keep all the names and emails in one place and continue to market to them for basically forever! That process or system, was called a sales funnel. If you haven’t heard of a sales funnel, then I’m about to break it down for you so it’s easy to understand…. 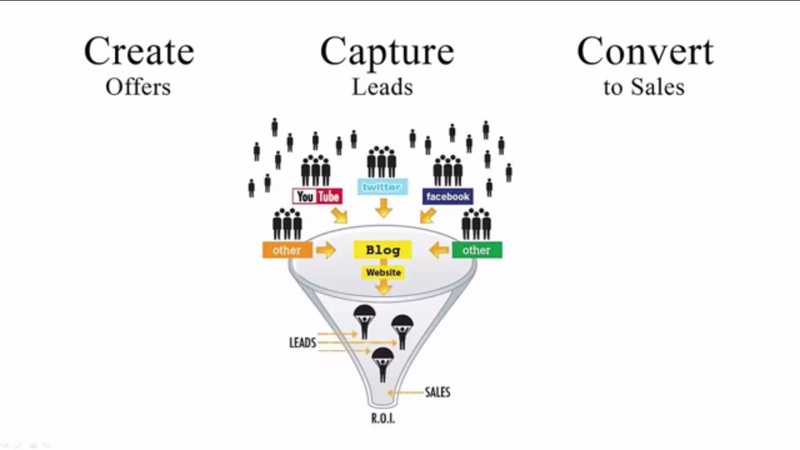 A sales funnel is a process as you can see in the picture above. It’s taking a lot of interested people to become leads and getting them towards the bottom-that is where the sales and money are. Anyone that is in your funnel will get your emails, which you can introduce yourself, provide relevant information and of course market your product to them. The purpose of a sales funnel is to sift, sort, follow up with leads, and sell your products or services for you, mostly done on autopilot. Once your funnel is set up the only thing you need to concentrate on is getting traffic to your capture page. Then once your leads start coming in, your follow up emails will go out to your prospects so they can buy (if they didn’t already) or to even upgrade to higher level product without you having to do any extra work. Many people do not buy the first time they see an offer. It usually takes a couple exposures for them to finally make the decision to purchase; on average about 5 exposures! Therefore when your lead opts in, overtime you can expose them to your product as often as you like. Your funnel is also a great tool to help build rapport with your list. Most marketers know that people only buy from those they like, know or trust. So not only can you market your products, but you can also give them more relevant information as well as share your story and opinions-making a stronger connection with your prospects, especially if they can relate or agree with what your saying. Using a sales funnel helps sort out the time wasters as well. How? Simple-those who are not really interested in your products or offers can easily unsubscribe to your funnel. This saves you time especially if you are personally trying to reach out to your prospects. Another awesome aspect of it is, as I stated before, it’s about 90% automated. You may spend time in the beginning to set up the ad, the offer, the follow up emails or some relevant content, but once it’s done, you can use it over and over-consistently making sales without re-doing any work. And so on… The purpose is to get people interested in it and want more information. So they’ll click on your banner or ad, or possibly respond to your post on social media or if you’re doing a quick video they could click the link at the bottom of your video. With a teaser, you only reveal a little bit of information about your product, raising interest or curiosity to your audience. This is a very important piece of your funnel because it’s basically the gateway to enter into the funnel. If your capture page isn’t enticing enough for people to enter their information, then you will not get any leads. You get the idea, but the list can go on for what you could potentially offer your prospects. This is what you promised on your lead capture page or it’s information about something that relates to your offer that can lead them to your capture page. It doesn’t matter if you go from the capture page to the information or vise versa. I have used both ways and either way can work. As long as it is useful information for your prospects, then it’s relevant. This is a page where your prospect has the option of purchasing your products. The sole purpose is to get visitors to become your customers. It will contain a pitch for your product and a call to action button. Lastly are the emails. You can now continue to market to your new prospects because they have put in their contact information. But with that, you are going to need an auto-responder. An auto-responder saves you time because you can create your emails and schedule them to go out over the course of several months. Then when you need to announce a new product or sale, it won’t come off as too pitchy, because you’ve been in contact throughout the course of a few weeks or months building a relationship with your list. While having a sales funnel is super beneficial in selling products, there is a problem that can be found which is linking all these pieces together-kind of like “Frankenstein-ing” your sales funnel together. For example, there are many great auto-responders to use like AWeber or MailChimp. Not only would you have to link that service to the sales funnel service you use, there is another problem I have found. And that is, either the more prospects on your list, the higher your monthly bill to use the service, or there is a limit to how many emails you can send per month. Now if you’re just getting started that’s okay to use, but when you grow your list, you would need to upgrade. Using many different services can run you in the hundreds of dollars with monthly fees or limited usage of a service. When you’re just starting out trying to sell your products you may not have the budget for spending that type of money. But I have found a solution to not spend a boat load of money and not have to use several different services to link everything up. It’s an all in one marketing system that is extremely easy to use, even if you’re a beginner in internet marketing. I have personally used this system to generate over 330 leads for my products and it continues to grow. I went from having absolutely no leads or sales to plenty of prospects and sales using this sales funnel system. If you are ready start using a system to sell your products, then I invite you to take a look at what I use by clicking here. P.S. Did I mention you can test drive the system for F.REE for 7 days?? Try it here! Select those sites most relevant to your content and promote heavily, but don’t just publicize your own content. Thanks for stopping by and commenting. Is that a sign? 😉 I just do what I see other big marketers do. Thanks so much, I will check that out! You’re welcome, glad it cleared up some things for your about sales funnels. I’m not sure what you mean by the last 2 questions?